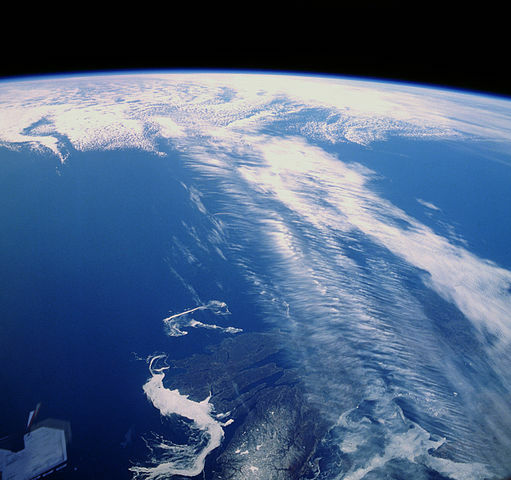 The infrared atmospheric window is the overall dynamic property of the earth’s atmosphere, taken as a whole at each place and occasion of interest, that lets some infrared radiation from the cloud tops and land-sea surface pass directly to space without intermediate absorption and re-emission, and thus without heating the atmosphere. It cannot be defined simply as a part or set of parts of the electromagnetic spectrum, because the spectral composition of window radiation varies greatly with varying local environmental conditions, such as water vapour content and land-sea surface temperature, and because few or no parts of the spectrum are simply not absorbed at all, and because some of the diffuse radiation is passing nearly vertically upwards and some is passing nearly horizontally. A large gap in the absorption spectrum of water vapor, the main greenhouse gas, is most important in the dynamics of the window. Other gases, especially carbon dioxide and ozone, partly block transmission. An atmospheric window is a dynamic property of the atmosphere, while the spectral window is a static characteristic of the electromagnetic radiative absorption spectra of many greenhouse gases, including water vapour. The atmospheric window tells what actually happens in the atmosphere, while the spectral window tells of one of the several abstract factors that potentially contribute to the actual concrete happenings in the atmosphere. Window radiation is radiation that actually passes through the atmospheric window. Non-window radiation is radiation that actually does not pass through the atmospheric window. Window wavelength radiation is radiation that, judging only from its wavelength, potentially might or might not, but is likely to pass through the atmospheric window. Non-window wavelength radiation is radiation that, judging only from its wavelength, is unlikely to pass through the atmospheric window. The difference between window radiation and window wavelength radiation is that window radiation is an actual component of the radiation, determined by the full dynamics of the atmosphere, taking in all determining factors, while window wavelength radiation is merely theoretically potential, defined only by one factor, the wavelength. The importance of the infrared atmospheric window in the atmospheric energy balance was discovered by George Simpson in 1928, based on G. Hettner’s 1918 laboratory studies of the gap in the absorption spectrum of water vapor. In those days, computers were not available, and Simpson notes that he used approximations; he writes: “There is no hope of getting an exact solution; but by making suitable simplifying assumptions … .” Nowadays, accurate line-by-line computations are possible, and careful studies of the infrared atmospheric window have been published.